Royal Caribbean's Symphony of the Seas has generated a lot of interest among Royal Caribbean fans and first time cruisers alike, and with a ship this intriguing, there are a lot of concerns and questions people may have. We decided to list answers to some of the most commonly asked questions related specifically to Symphony of the Seas for everyone's future reference. When can I reserve shows onboard? Royal Caribbean has added a lot of great entertainment on Symphony of the Seas. Guests are able to reserve shows on their Symphony of the Seas cruise, although when exactly they become available varies from sailing to sailing. The truth is, there is no rule about when these kinds of activities become available for booking, and every sailing can be different. Typically, we see entertainment become available to reserve online around 75-60 days prior to the sail date, but your experience may vary. What makes Symphony different from other Oasis-class ships? No Sabor on Boardwalk. Instead, Playmakers Sports Bar & Arcade occupies entire side of the Boardwalk neighborhood. Sugar Beach Candy Shop (candy and ice cream) takes up much of other side of Boardwalk neighborhood. Symphony of the Seas features the Ultimate Family Suite stateroom. What are the Windjammer hours? Exact times can change, but here are the Windjammer dining hours we have seen thus far. What is the new Royal Caribbean app and how does it work? 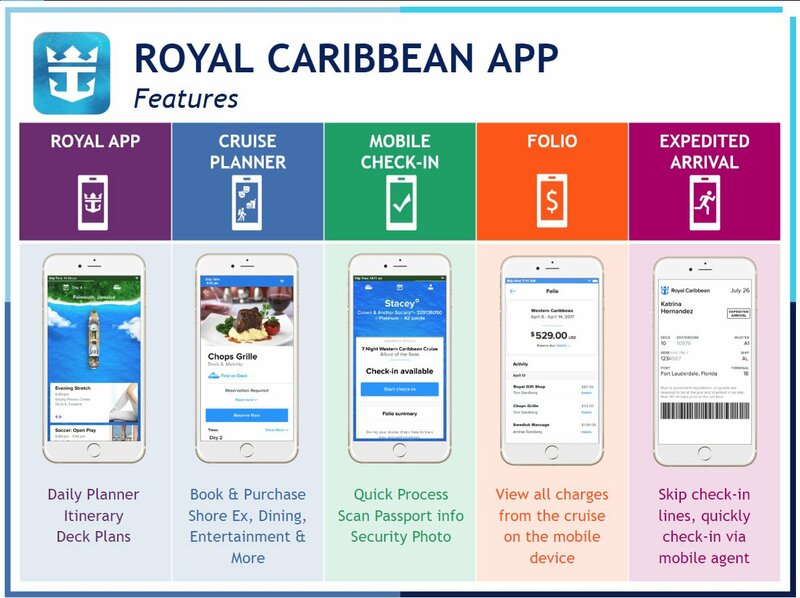 Royal Caribbean is developing a new smartphone app, which allows guests to manage multiple aspects of their cruise vacation from the app. On Symphony of the Seas, guests can perform a variety of functions. Here are the important functions the app can perform currently. Keep in mind that the app is under active development, and new features are forthcoming. There is no cost to use the Royal Caribbean app and you do not need a WiFi package to use the app onboard. A chat feature between guests is coming soon. Does Symphony of the Seas offer WOWbands? Yes, Symphony of the Seas offer RFID bracelets known as WOWbands. WOWbands are essentially optional replacements for your SeaPass card. Imagine a bracelet you can wear that allows you to open you stateroom door, charge onboard purchases or check into shows and restaurants. They are made of silicone and come in a variety of colors: white, yellow, black and blue. WOWbands use Radio Frequency (RF) technology that can be read by Royal Caribbean's readers that are found at kiosks, tablets and mobile scanners that Royal Caribbean crew operate. Your WOWband is linked to your SeaPass account and holds all of your information related to your cruise vacation such as your stateroom information, dining reservations and more. Guests on Symphony of the Seas can choose to purchase WOWbands for $4.99 each and can be purchased at Guest Services. 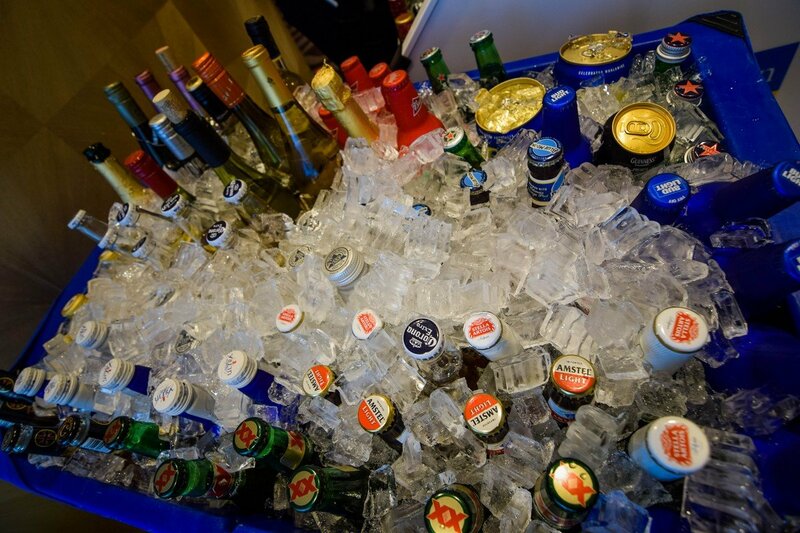 They are complimentary for suite guests and will be waiting in your suite. Can I use my Starbucks app/card on Symphony of the Seas? You can use your Starbucks card at the Starbucks kiosk onboard for paying for drinks and earning rewards, however, you cannot redeem free rewards via the Starbucks app/card. In addition, none of Royal Caribbean's drink packages work at Starbucks on Symphony of the Seas. Instead, those drink packages can be used for specialty coffee beverages at other locations on Symphony, including Cafe Promenade, Park Cafe, or any specialty restaurant. 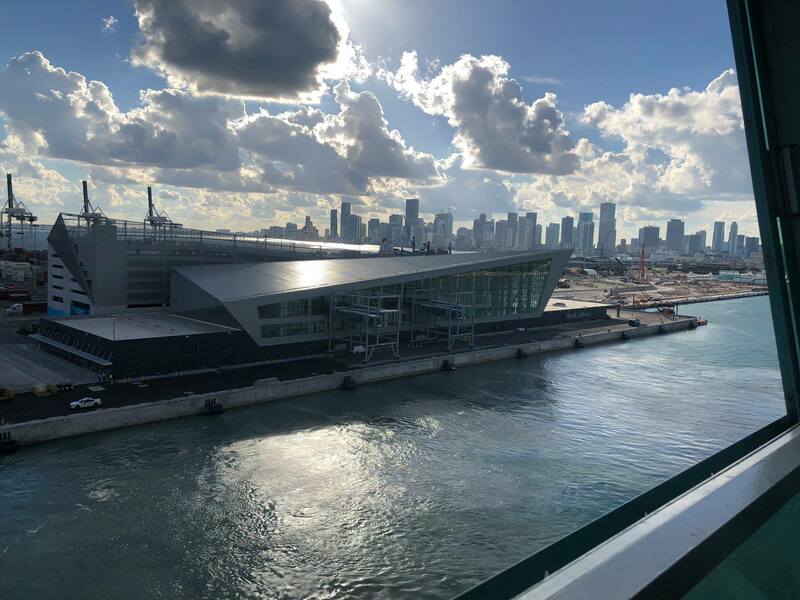 Where does Symphony of the Seas dock in PortMiami? Symphony of the Seas begins and ends her sailingsa tthe brand new Terminal A at PortMiami. This is a new state-of-the-art cruise terminal that features stunning architecture, and a new boarding experience. The quickest way to get onboard will be using the Royal Caribbean International app to check-in. You can download the app from iTunes App Store and Google Play Store now for free. Online check-in remains open until 48 hours prior to departure, so be to complete it before arrival at the terminal in order to skip the check-in counter at the terminal. Then, be sure to save your SetSail Pass on your mobile device or print for all guests in their party. The SetSail Pass is the key to adventure. If you elect to park at Terminal A, go straight to the garage where agents will receive luggage and review documents. If you are taking a taxi or using a ride sharing service, agents will be waiting at the drop off area. any medication they may need. Did we miss your question? Post it in the comments below and we will try our best to answer it! Royal Caribbean is is partnering with the GRAMMY Museum® – the official foundation of the Recording Academy™ – to fund music education programs in underserved high schools within the Miami-Dade County Public School District. Twenty local schools will receive grants from Royal Caribbean through the GRAMMY Museum® Signature Schools program, and the chance to perform at Symphony’s naming ceremony. The 20 schools were selected for maintaining thriving music programs with only limited resources. As the first Signature Schools program dedicated to Miami-Dade County Public Schools, Royal Caribbean and the GRAMMY Museum is taking music education beyond the classroom to inspire the next generation of performers with firsthand, career-building experiences. Each school will be honored during an exclusive tour behind the scenes at the Royal Caribbean Entertainment Studios on Florida International University’s Biscayne Bay campus, complete with hands-on introductions to what a career in music and entertainment could look like. Students will spend a day at the 132,500-square-foot, state-of-the-art facility, which features a 300-seat theater, a 20,000-square-foot, costume-making facility, 14 dance studios, 15 vocal rehearsal rooms, an audio recording studio, two aerial training studios, and more. Further spotlighting the arts and flourishing talent in South Florida, one student ensemble will be invited to perform on a global stage at the official naming ceremony of Symphony of the Seas on Nov. 15 at Royal Caribbean’s new state-of-the-art Terminal A.
Symphony of the Seas offers guests a lot of fun activities and things to do onboard that will keep your family busy throughout your Royal Caribbean cruise. In fact, the cruise line includes a lot of entertainment in your cruise fare, which means there is no additional cost to enjoy them. Among the many choices, we picked out our top ten things to do on Symphony of the Seas that have no additional cost. Did you know the hit Broadway show, "Hairspray" is included in your Royal Caribbean cruise fare? On Symphony of the Seas, you can zip line 9 decks above the Boardwalk on a path that measures 82 feet from start to finish. Guests wanting a thrill will be sure to checkout the Ultimate Abyss slide on Symphony of the Seas. Rides on the Ultimate Abyss are included with your cruise fare, so you will have plenty of opportunity to scream down the slide, over and over again. The AquaTheater is arguably one of the top entertainment venues on any Royal Caribbean ship, because it offers some of the very best shows the cruise has developed. 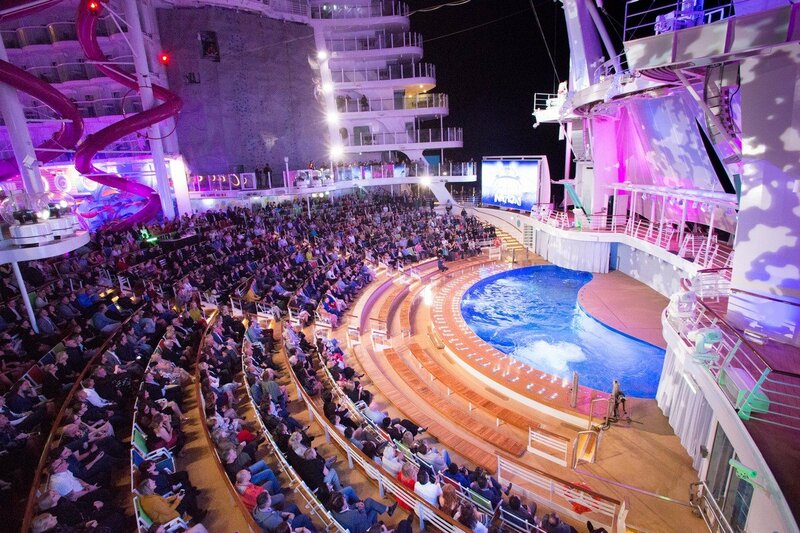 Onboard Symphony of the Seas, guests can enjoy performances of "AquaNation", which features something Royal Caribbean calls "4D harnessing" for its aerialists, who can move up and down, side to side and forward and back into the audience space. Another AquaTheater show, "HiRo" is coming soon to Symphony of the Seas and Royal Caribbean promises it will raise the bar for aqua shows with more high flying feats, unexpected stunts and extraordinary acrobatics than ever before. HiRO pushes the limits of a theatrical production at sea with cutting-edge technology and choreography and. No two shows are the same, making it worth seeing twice. The AquaTheater on Symphony of the Seas features two 10-meter high platforms and the hydraulic-floored pool, the largest and deepest freshwater pool at sea, below serves as podiums for high-diving, hair-raising aerobatics that AquaTheater audiences have come to love. 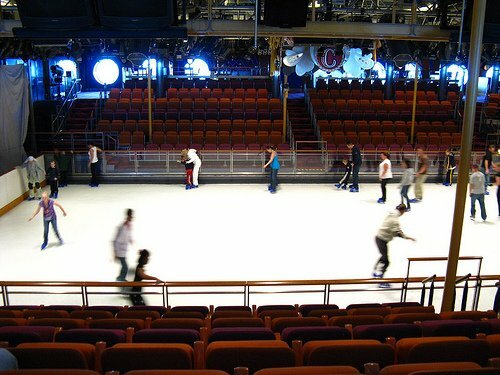 While on Symphony of the Seas, you can don a pair of ice skates and try ice skating at sea. Regardless of your previous ice skating experiences (or lack thereof), anyone can put on a pair of skates and join in. Free skates are offered throughout the cruise along with special time for advanced skaters. Be sure to catch the complimentary ice show in Studio B, 1977, too! There is no question guests of all ages find water slides a favorite cruise ship activity, and Symphony of the Seas offers three slides to enjoy over and over again. The Perfect Storm trio of water slides offer two racer slides and a champagne bowl slide that are included in your cruise fare. As you slide down any of the slides, you will twist and turn three decks into a splashy finish. Got kids? If so, expect them to want to spend a lot of time at Symphony of the Seas's aquatic adventure park known as Splashaway Bay. In the Boardwalk neighborhood, guests young and old can enjoy a ride on a classic carousel that is sure to bring a smile to anyone's face. The carousel on Symphony of the Seas is hand-crafted and especially designed by Carousel Works for Royal Caribbean and is one-of-a-kind. 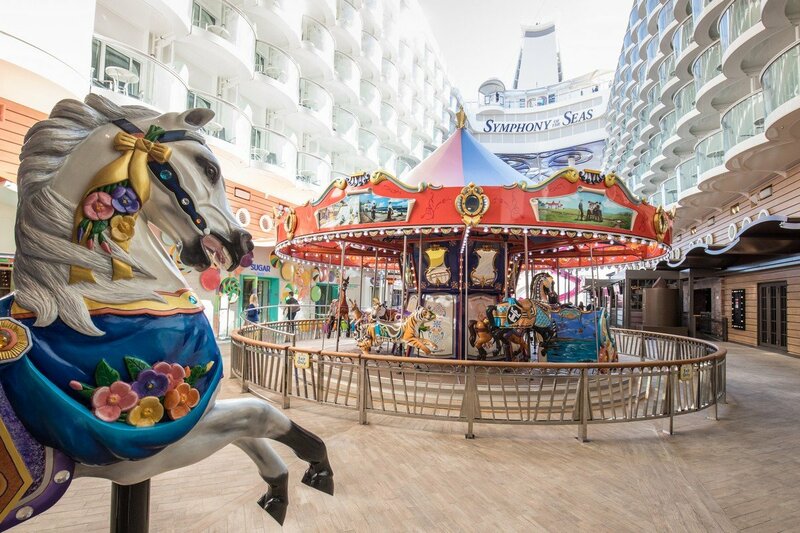 Inspired by turn-of-the-century carousels that were found in the northeastern United States, Symphony of the Seas' carousel is a classic attraction that is as beautiful in design as it is enjoyable to ride. 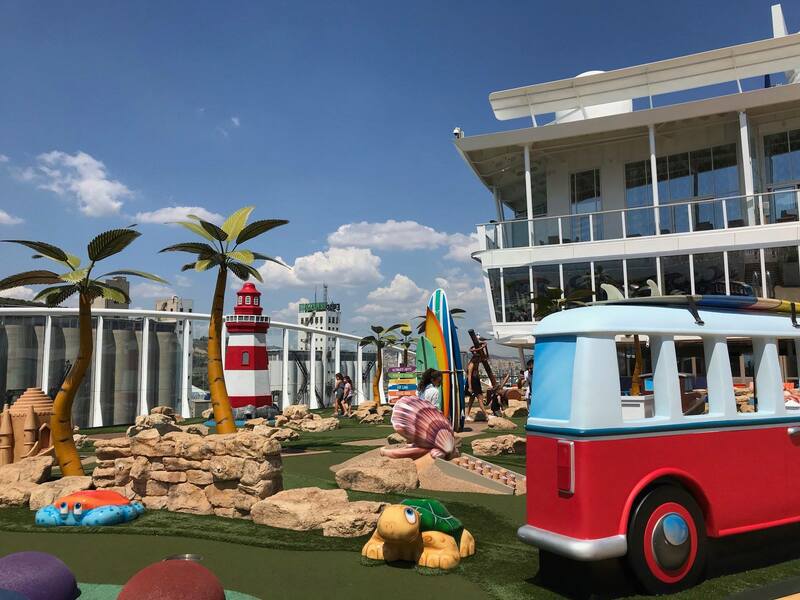 Miniature golf has been a timeless family activity, and on Symphony of the Seas you can put your putting skills to test. You can play on the green as often as you like, while enjoying some beautiful views of the ocean that surrounds you. No reservations are required, just show up and grab a putter and ball. Be sure to try out night time mini golf one evening to mix things up. Symphony of the Seas takes art to a new level with innovative pieces that combine creativity and engineering to create immersive pieces that will excite the imagination. With over 3,000 pieces of art on board, there is plenty to explore. Symphony of the Seas may be the fourth Oasis Class cruise ship, but she is not without her own innovations and first-of-a-kind experiences. In the past, subsequent sister cruise ships in a class were often very similar to the ships that came before, but Royal Caribbean added a lot of new activities and offerings on Symphony of the Seas to provide guests plenty of incentive to try her out. Here is our list of the top seven ways Symphony of the Seas is different from Oasis, Harmony or Allure of the Seas. The artwork on any Royal Caribbean ship will be a major differentiator from other vessels, but we think the Solarium art installation was so significant, it merited mentioning on its own. A one-of-a-kind work of art comprised of thousands of dichroic acrylic elements is the first to be featured in the Solarium, spanning an area of 2,594 square feet and flooding the pool beneath with natural light. The poolside palm trees bathed in this contrast of light and shadow make it a must-see (and Instagramed) site to see. 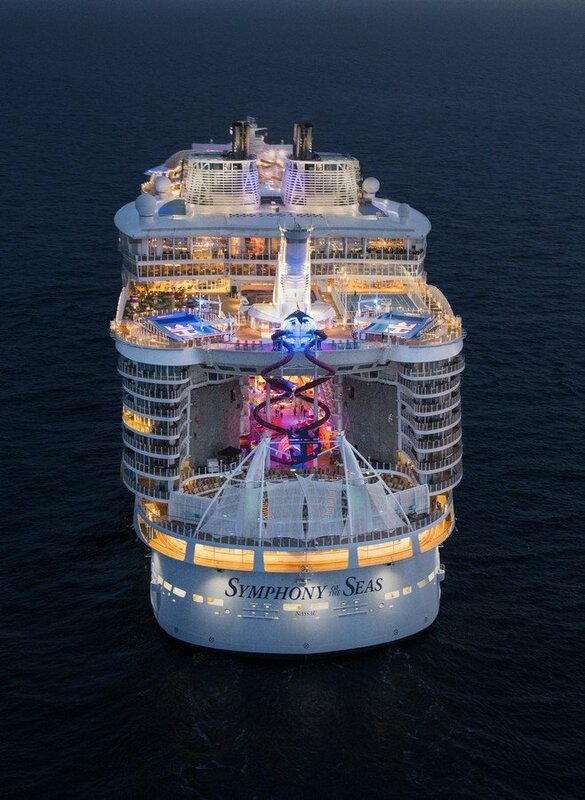 Symphony of the Seas is the first Oasis Class ship not to feature Sabor on the Boardwalk, or anywhere on the ship. Royal Caribbean opted to rethink its Boardwalk neighborhood a bit and introduced the Playmakers Sports Bar & Arcade. It spans the entire length of one side of the Boardwalk neighborhood, and is home to sports watching, arcade games and tasty food. Much like Playmakers, Sugar Beach is a brand new candy and ice cream shop that is not on any other Royal Caribbean ship. The concept was to offer sweet treats for adults and kids alike. Rather than just being "another candy shop", Sugar Beach features colorful candy-packed walls with ice cream and tons of toppings. In addition, it is home to some baking events onboard. Symphony of the Seas introduced the Ultimate Family Suite stateroom, which is less of a stateroom and more of a family-inspired castle at sea. The two-level room has some incredible features, such as an exclusive slide from the kid’s only bedroom down to the living room below; a floor-to-ceiling LEGO wall, an air-hockey table and hidden nooks for chilling. There is also a separate 3D movie theater-style TV room, complete with popcorn machine and a library of video games across multiple gaming systems. If all that was not enough, there is also a 212 square foot wrap-around balcony and a full-size whirlpool for fantastic views. Dining is at the heart of what Royal Caribbean offers on its ships these days, and Symphony of the Seas ushered in a few new restaurant concepts for guests to enjoy. While Sabor is not on Symphony of the Seas, Royal Caribbean does offer a new Mexican restaurant in El Loco Fresh that serves up fresh and fast Mexican favorites. In the Solarium, guests can try fresh seafood and a robust raw bar at Hooked Seafood restaurant. From the cruise line that brought you the FlowRider, rock climbing wall and Ripcord by iFly, comes glow-in-the-dark laser tag. Located in Studio B, Battle for Planet Z offers friends and family the chance to battle for laser tag dominance in this new glow-in-the-dark laser tag experience, complete with state-of-the-art technology and special effects. Royal Caribbean did not just "copy and paste" its entertainment line-up from other Oasis-class ships for Symphony of the Seas. A number of brand new productions are available on Symphony of the Seas that are shown throughout the ship and a brand-new experience for all guests. Hairspray: Big hair, big dreams and all the right moves — you can’t stop the beat in this Tony Award-winning Broadway hit. Flight: An uplifting historical satire on the evolution of air travel that ends with homage to the famed Wright Brothers. 1977: This spectacular adventure on ice follows a time traveling, dimension-jumping hero as he is called upon in London to recover Her Majesty's Crown Jewels in time for the famous Silver Jubilee. HiRo: A mind-blowing show that combines cutting-edge technology, future-forward choreography, unexpected stunts and highly innovative, physically extraordinary acrobatics. During Royal Caribbean's second quarter 2018 financial call with investors, the company shared some interesting anecdotes, facts, and insight into the ever changing cruising environment. While most of the information discussed in these earnings calls deal primarily with financial indicators, cruise guests can glean some insight into how Royal Caribbean runs its business. Royal Caribbean Cruises Ltd. (RCL) Chairman and CEO Richard Fain started off the call with investors beaming about the positive response Symphony of the Seas has received in her inaugural season in Europe. Fain indicated that not only is the ship booked well, but guests are raving about the experience and the high level of service they are experiencing. "Her performance for a first time ship in a new market. For her to perform so amazingly well when she is the fourth in a series, is a testament to the innovations the team has incorporated and the power of the Royal Caribbean International brand. This ship has remarkable new wow's, new shows, and new activities, but what truly sets her apart is the careful execution and high level of service which have been pivotal in achieving these record-breaking ratings." Of particular interest to Royal Caribbean cruisers is an update was given on the progress being made with the cruise line's new smart phone app and technology innovation, known as Project Excalibur. Fain offered an update on where the project stands, and seemed bullish on the prospects of rolling the app out to most ships in the fleet by the end of 2019, as well as the progress being made. There were no specific updates in terms of when certain functionality will be completed, but it did sound like they wanted to get it right the first time, instead of just pushing out an app that may or may not work well. "The program is on track and the progress is impressive. We have taken a methodical, hands-on approach to this implementation, rolling out new upgrades on a monthly basis or even more frequently. 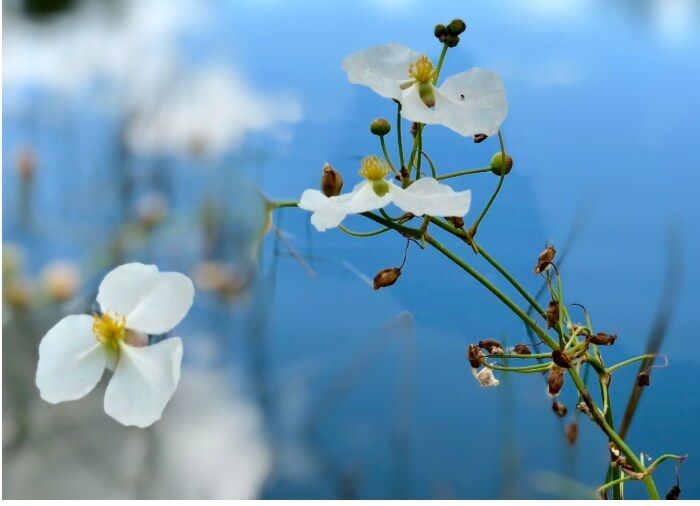 We're finding that this 'softly softly' approach allows us to move more quickly, but also to correct the errors early before they impact a lot of vacations. We continually add features to the app, and we remain on our trajectory of having half the fleet connected by the end of this year and most of the rest by the end of next year. The most complete version of the app today is on Symphony of the Seas, and in December, that distinction will be taken over by Celebrity Edge. One interesting milestone is the introduction of frictionless arrival. We have been rolling this out on a limited basis and expect that it will be operational on a large scale basis on Symphony of the Seas and on Celebrity Edge later this fall. By the way, we recently trademarked the term 'frictionless', so don't expect to see that being used by any other cruise line." If you spend time listening to these earnings calls, one trend that continued again this quarter was higher spending by guests, namely in the form of drink packages and other packages that can be purchased online or onboard. In short, a lot of Royal Caribbean's revenue can be traced back to guests not only booking cruises in droves, but also because they are spending more than ever once onboard. RCL Chief Financial Officer Jason Liberty spoke about onboard spending during his summary of the quarter, "The beat was driven by stronger than anticipated close-in demand, and better than expected onboard revenue spend. Onboard areas, such as beverage, specialty dining and internet, helped deliver a 5.5% year-over-year increase in onboard revenue." If there is one ship not named Symphony of the Seas that has hit a home run for Royal Caribbean, it is definitely Mariner of the Seas. Mariner of the Seas has the distinction of being a very popular choice with consumers that are looking for short cruises, and has been a boon for the cruise line in terms of being booked well and driving up revenue. In providing an overview of the Caribbean cruise market, Jason Liberty spoke about the impact Mariner of the Seas has had, "Demand for the Caribbean sailings has been strong, with bookings trending ahead of last year's very storng numbers. Our Caribbean capacity is up in the back half of the year, due mainly due to the addition of the reimagined Mariner of the Seas for the short Caribbean market. Our strategy behind modernizing the Mariner of the Seas was to offer the best alternative for a short Caribbean getaway as a response to consumer trends. The younger generations are opting for shorter, more frequent vacations and the Mariner of the Seas is very well positioned for this segment with onboard activities, dining options, and entertainment similar to those on Oasis class ships. Mariner of the Seas is booked very well and we are particularly excited about 2019. While we generally don't expect to recieve many bookings for short Caribbean sailings that are more than six months away, Mariner of the Seas' load factors in the first half of 2019 are closer to those of seven-night products than they are to shorter products." Towards the end of the call, an analyst asked Royal Caribbean's leaders about any lessons learned from the 2017 hurricane season that they can apply to the 2018 hurricane season. This was an opportunity for Royal Caribbean to talk about the impact the cruise line had on the people affected by the storms, and the positive public relations and humanitarian response that Royal Caribbean saw. Richard Fain spoke about the lessons learned, "We felt our response last year was really ended up being quite good. Probably built up a fair amount of good will from the way we handled it, and I'm not sure that from a pure financial point of view we learned much that would significantly change the outcome if you had, again, a hurricane that exactly tracked as our ships itinerary and exactly hit the ports of call on the days that they would be most impactful. So we constantly try and learn, and obviously there are always some lessons to be learned, but overall, I think we felt that last year we did pretty well. I do think though that people should be impressed by how well the destinations responded afterwards. These were horrific events for them, but now people are reporting back and travel agents, which are always an important source of information as well as internet chatter, shows how well they've recovered and I think that may help us a little bit in terms of assuaging the concern that people had that if they went to some of these destinations afterwards they would encounter a bad experience. And that simply hasn't been the case."